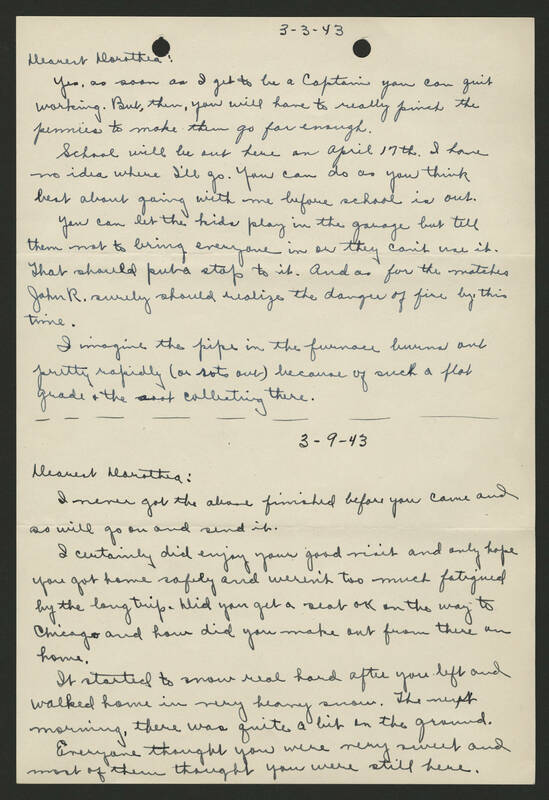 3-3-43 Dearest Dorothea: Yes, as soon as I get to be a Captain you can quit working. But, then, you will have to really pinch the pennies to make them go far enough. School will be out here on April 17th. I have no idea where I'll go. You can do as you think best about going with me before school is out. You can let the kids play in the garage but tell them not to bring everyone in or they can't use it. That should put a stop to it. And as for the matches John R. surely should realize the danger of fire by this time. I imagine the pipe in the furnace burns out pretty rapidly (or rots out) because of such a flat grade & the soot collecting there. - -- --- ---- ---- 3-9-43 Dearest Dorothea: I never got the above finished before you came and so will go on and send it. I certainly did enjoy your good visit and only hope you got home safely and weren't too much fatigued by the long trip. Did you get a seat OK on the way to Chicago and how did you make out from there on home. It started to snow real hard after you left and walked home in very heavy snow. The next morning, there was quite a bit on the ground. Everyone thought you were very sweet and most of them thought you were still here.